Devotees from Vrinda Mission have published at their blog http://vrinda-argentina.blogspot.com/ about the visit of Sripad BV Padmanabha Swami at the home of one of the secretaries of the India Ambassador in Argentina which took place last month. Padmanabha Swami was accompanied by brahmacaris of Harijan Mandir from Buenos Aires, Argentina Yatra. 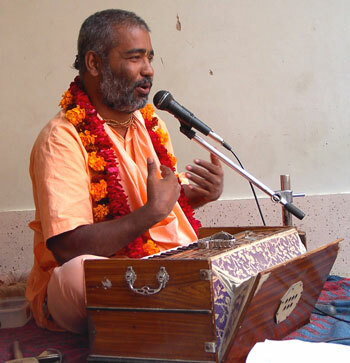 Sripad BV Padmanabha Swami sharing with the attendants for about 3 hours in length the millennial message of Vedic culture. Different members of the Embassy of India along with their wives, attended the meeting, during which devotees also sang beautiful devotional songs. The enthusiastic audience kept making several questions about Vaishnava philosophy, and its correct relevance and implementation in these times. The audience absorbed in listening to the stories of Krishna lila and His Many lessons. And as a finishing touch, delicious prasadam prepared by the same members of the Hindu community, was happily shared by all.